A BOutlineListView displays a list of items that can be structured like an outline, with items grouped under other items. The levels of the outline are indicated by successive levels of indentation. First, the BOutlineListView is created, with a rectangle computed by insetting from the parent view's bounds rectangle. The B_MULTIPLE_SELECTION_LIST flag is specified to indicate that the user should be allowed to choose more than one item in the list. This creates a new item in level 0 (the "region" level). a pointer to the new item for California is saved in the variable state. California is then further divided into cities: Menlo Park and Los Angeles, which reside at level 2 of our outline list. These are inserted under the California item by specifying the pointer to that item (locality) when calling AddUnder(). Then the Europe region is added (in level 0), and the nations of France, Germany, and Italy are added as localities (level 1). Each of those three localities has cities, which are added into level 2. 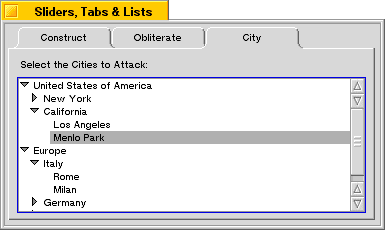 Finally, a BStringView is created to label the list with a prompt indicating that you should "Select the Cities to Attack:". If an item has other items under it—that is, if the immediately following item in the list is at a deeper level of the outline—it is a superitem; the items grouped under it are its subitems. Superitems are marked by a triangular icon or latch, in the usual interface for hypertext lists. The user can collapse or expand sections of the outline by manipulating the latch. When a section is collapsed, only the superitem for that section is visible (and the latch points to the superitem). All items that follow the superitem are hidden, up to the next item that's not at a deeper outline level. When a section is expanded, subitems are visible (and the latch points downward). The BOutlineListView class inherits most of its functionality from the BListView class. However, inherited functions are concerned only with the expanded sections of the list, not with sections that are hidden because they're collapsed. If an inherited function returns an index or takes an index as an argument, the index counts just the items that are shown on-screen (or could be shown on-screen if they were scrolled into the visible region of the view). DoForEach() skips items that can't be displayed. CountItems() counts items only in the expanded sections of the list. However, the functions that the BOutlineListView class itself defines are concerned with all sections of the list, expanded or collapsed. For its functions, an index counts all items in the list, whether visible or not. The class defines some functions that match those it inherits, but its versions prefix FullList…() to the function name and don't ignore any items. For example, FullListCountItems() counts every item in the list and FullListDoForEach() doesn't skip items in collapsed sections. In some cases, BOutlineListView simply overrides an inherited function without adding the FullList…() prefix. You should always use the BOutlineListView versions of these functions, not the BListView versions. For example, BOutlineListView's version of MakeEmpty() truly empties the list; BListView's version would remove items from the screen, but not from the real list.